The general consensus among many east coast migratory pollinators is that as long as they stay in business, there should be enough bees for east coast pollination. 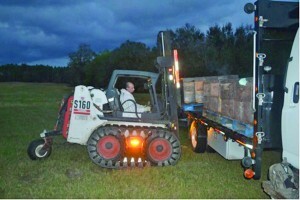 The beekeepers will do what’s necessary to make up the previous year’s hive losses (averaging 50 percent plus last year,) by making splits in Florida and ordering queens from Hawaii, so that when pollination time arrives, the hives will be there. Some, however, have had such deep losses that they expect to need to lease some bees to fulfill their pollination contracts. “Pollination isn’t over until the grower releases you,” explained New Jeresy-based commercial pollinator Grant Stiles, who supplies 1,000 hives for North Carolina blueberries, and sends 2,000 (different) hives to New Jersey. Last year, with New Jersey blueberry pollination running late, at least one big commercial operator arrived in Maine for blueberry pollination about two weeks behind schedule, a disaster for the Maine grower. Maine wants to make sure this doesn’t happen again. Maine blueberry pollination pays well — $100 to $125 a colony this year. Plus Maine blueberries growers have agreed, according to Hackenberg, to use no systemic insecticides during bloom, and to spray only at night if fungicide sprays are needed while the bees are on location. This looks good to migratory pollinators. So to compete for pollination, New Jersey blueberry growers have had to raise their pollination fees significantly, to about $80 a hive. After a 60 percent colony loss last year, Winter’s bees are in Florida building up. New York apple pollination prices have always tended to be on the low side. “We pollinate for 40 to 50 New York orchards,” he continued, “and our bottom line is that our pollination prices have to go up 20 percent this year. Bees that have been in apple pollination have some of the highest colony die-offs rates. “We see the worst bees are the ones that went to apples. The systemics applied in summer haunt us the next spring. Every year, it seems to get worse. Commercial beekeeper Jim Doan does pollinate New York apples. “About 30 percent of our bees in apples die,” he stated, “and 75 percent of the rest die later in the season. The systemic sprays accumulate not only in the pollen and nectar in the apple trees, but also in all the water under the trees and the dandelions and mustard on the orchard floor. Dennis Wright, whose home base is Fruitwood Apiaries in New Jersey, has a long-standing reputation for strong story-and-a-half hives and prompt delivery and removal of those hives. His reputation so good, his growers pay him a small premium in pollination fees. His bees are employed at some of the biggest blueberry operations in New Jersey. “Cranberry pollination is harder on bees than blueberry pollination,” said Wright. “It’s not so much the sprays, from what I’ve seen. It’s the lack of pollen and nectar. Cranberries simply produce very little of either. You can’t find a bee flying back to the hive with pollen in my area. 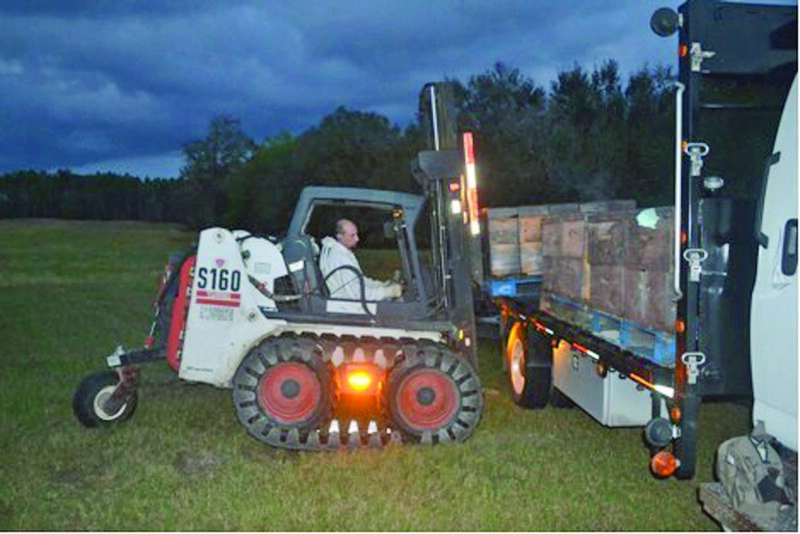 Immediately after New Jersey cranberry pollination, Wright whisks his hives to an unsprayed area southwest of Sarasota, FL, and puts them on ranches to begin recovering for the next year’s pollination. For labor, chemicals and queens, Wright estimates he puts about $200 in each hive every year. “We lose queens frequently,” he said. “Our bill for queens last year was $76,000, plus labor.” His mite treatment schedule is daunting, and his six workers check each hive every two weeks. Bee operations are needing to hire more and more labor to stay ahead of the mites and check hives (not just lift the lid-really check) to keep hives queen-right. Many operations are checking each hive every two weeks. During summer pollination in New Jersey, Delaware and Maryland, the Harveys “swap” hives for their growers every three weeks, exchanging the hives they have for ones that have been recently closely checked and beefed up, if necessary. Like hives, queens use to live. You use to have to find and pinch an old, failing queen before you could introduce a new younger queen to lay a better brood pattern. Now queens are turning over several times a year. There are a lot of theories floating around about why this is the case, but unfortunately, as New Jersey based commercial beekeeper Grant Stiles explained, “None of the theories are anything the beekeepers can do anything about, except for mites. “You’d be hard put in my operation to find mites,” he continued, “and yet my high hive losses continue. Fungicide and insecticide sprays are one factor, but beekeepers can’t stop farmers from using sprays or they’d be out of business. They have to get a marketable crop. “You can’t kill viruses,” he continued. Even with very low mite levels, the viruses are still in the hives affecting bees’ health. So that’s another factor beekeepers can’t remedy. All beekeepers can do is hire lots of labor and work very hard at checking their hives frequently and replacing losses for the next pollination season by making splits. That honey crops for most beekeepers on the east coast have been running significantly smaller than usual has not helped the beekeepers’ situations. In addition, the citrus greening insecticide sprays in widespread use in Florida have completely cut out the possibility of previously depended-on orange honey crops for many beekeepers.